Everything physical is made of atoms, including you. Atoms are made up of subatomic particles, which are tiny bits of contracted energy swirling around in seemingly-empty space. The subatomic particles that makeup your blankets, the floor and the air that you breathe aren’t any different than the subatomic particles that make up your body. Everything is made of protons, neutrons, electrons, quarks, muons and other things the average person doesn’t really understand. Everything is made of these same building blocks, yet everything is different. The difference arises from the patterns in which the particles swirl. Different patterns create different objects, including you. There is an energetic pattern for the human body, a template. We all have two eyes, one nose, one mouth, two arms, two legs, etc. The ancient yogis mapped the energy patterns of the template, an atomic map of the human body. Their map is the foundation for acupuncture as well as many of yoga’s practices. Acupuncture calls these energy flows meridians. Yoga calls them nadis. Thousands of years ago, yogis mapped all of the 720 million nadis in the human body. All of them branch out from the core flow, in middle, your spine. Your nervous system is the physical equivalent of the nadis with all your nerves branching off from your spinal cord. If scientists designed an instrument to detect these energy flows in the human body, they would find the template the yogis describe, and tell you that your spine and nervous system hold the highest concentration of energy in your whole body. Unfortunately this means that your spinal tensions have not only physical effects, but they also block the flow of the energy that keeps you alive. Svaroopa® yoga specializes in core opening, which is the decompression of your spine, both physically and energetically. 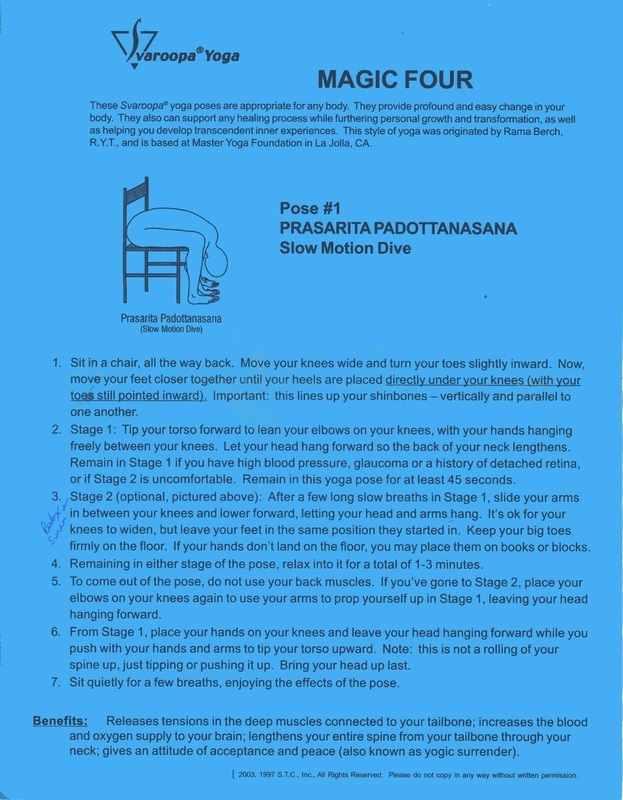 When you begin Svaroopa® yoga, you get rapid, almost miraculous improvement in your physical condition. From foot and knee pain, through digestive imbalances, to neck or jaw pain and even headaches, core opening helps all of them, even all at the same time. Chiropractors and osteopaths explain how this works, a familiar paradigm. Yet yoga describes more: the energy that makes your body’s energy grid work, called prana in Sanskrit, is the power of your own presence enlivening your own body. Decompressing your spine is like getting the kinks out of a garden hose, so your whole body becomes more fully alive, enlivened by you, from your spine outward. How important is your spine? In embryonic development, the spine forms first. The whole rest of your body, including your brain, formed after your spine. Swami Nirmalananda explains yoga’s perspective on this; .Consciousness manifests everything in this universe. Consciousness used your spine to direct your embryonic development as well as to empower everything afterward. Your brain blossoms forth on one end of your spinal cord. Most people think their spinal cord is a tail on their brain, but it’s actually the other way around. Your brain is the mushroom cap on the top end of your spinal cord. Your brain does not control your whole body, your spine does! When we use a particular pose to release tension in muscles connected to your tailbone or another part of your spine, we are working on your physical anatomy. Your body feels more open and free, which creates an instantaneous effect on your mind. Yet more is going on, whether you’ve been able to identify it or not yet. Simultaneously, the angles of all the poses are opening up subtle energetic levels. Yoga describes that the fullest potential of a human being becomes available through this inner opening, specifically through your spine. Consciousness also moves and flows, being the energy that materializes this world out of nothing. Your body is one of the things being materialized. In your body, a current of energy flows through your spine, keeping you alive and giving you the unique capacities of a human being. One of those capacities is something that few people have interest in exploring an inner potentiality. Most people explore the world outside of them, but yoga says your greatest potentiality lies within. While core opening gives you more prana (energy) to fuel you through your day and through your life, there is more. In Svaroopa® yoga, once you get enough opening at your tailbone, Grace ignites an inner fire the enlivening and enlightening power called Kundalini. This is your own personal power of upliftment, working within you to show you your own Divine Essence. Grace is defined as the blessing of the ancient sages, carried into our modern day by those who dedicate their life to discovering, and then sharing, these ancient mysteries. What this means is that Svaroopa® yoga is Kundalini yoga. Swami Nirmalananda has been doing this work quietly for years, not publicizing this information for several reasons. One is that few know what Kundalini is, so hearing that Svaroopa® yoga awakens Kundalini wouldn’t mean anything to them. In addition, others unfortunately suffer from widespread misinformation that makes Kundalini sound terribly scary. The greatest blessing a human being can receive in their life is the awakening of this inner force of radiance, but the media makes it sound terrifying. It’s not. Another reason that we don’t publicize Svaroopa® yoga as Kundalini yoga is because another style of yoga practice that uses that name. We choose to be respectful and not to create confusion. You may have done some Kundalini Yoga classes, which usually feature pumping your breath in rhythm with repetitive movements. Swami Nirmalananda says, .While, from my perspective, its spinal tightening, it is also ecstatic. They pump enough prana that the bliss pushes past the knots in their spine. In Svaroopa® yoga, we don’t pump the prana because we dissolve the knots in your spine and let the prana flow of its own accord, 24/7. We allow Grace to awaken Kundalini so the whole interior process takes place naturally, organically, smoothly and grace-fully. We call this .Alignment with Grace. Once your own personal Kundalini is awakened, most yogis get a feeling of physical warmth or inner spaciousness. Within a short time it may become a periodic surge of energy, while you are doing poses or meditating, which further dissolves the blocks you carefully installed, even lifetimes ago. As you open more, this inner current becomes a reliable flow that expands your knowing of your own Being and makes you able to see the world in a whole new way. Each stage along the way offers profound transformations, which help to uncover your deeper identity as Consciousness-Itself. This is Self, svaroopa. This is the inner blossoming of your own Divine Essence. Vidyadevi describes, At first, waves of bliss would move up my spine in meditation. As my spine became more open, I had a stronger experience of that bliss. In meditation, it was like a geyser was flowing through, not made of water, but of pure bliss. It was so powerful, so wonderful. I know now what Sage Shankaracharya describes in the Viveka-chudamani, ever expanding ecstasy. It is always flowing through your spine. It is there to be experienced and so much more, your own Self. Once you get a certain amount of core opening, the prana (life-energy) in your spine is amped up by a higher frequency moving through. Swami Nirmalananda.s presence and teaching assures these reliable effects of core opening: the release beginning at your tailbone provides (1) profound physical benefits, (2) transformative changes that improve how you feel in your life, and (3) the awakening of a profound energy flow through your spine, assuring you access to your own Divinity. Alignment with Grace is core opening. The spinal release that opens up what was hidden inside you; opening and aligning your spine opens a profound doorway to experiencing your own Self.